From the start, Michael Dix had always wanted to fly. Like most of us, he just took a while to get there — but now he’s one of our favorite WSC family members and we couldn’t be prouder to call this amazing dude our friend. 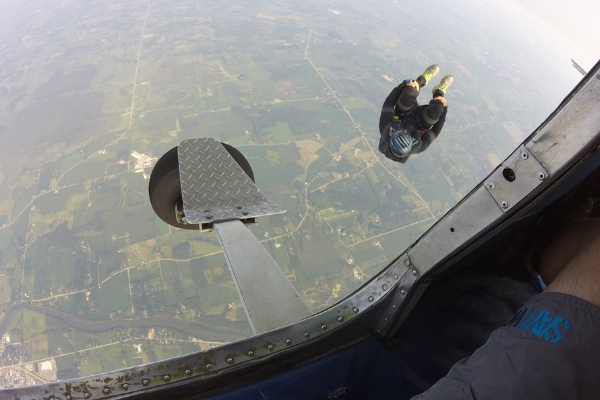 This is his fascinating skydiving story. In the end, the military wasn’t in the cards. Instead, Michael took a very different path. He graduated; went back to school; became a teacher; got married; fathered four boys. By a twist of fate, he ended up getting into law enforcement – and he’s never looked back. He was good at it, too. Well-liked and respected, he made his mark quickly. When Michael landed a spot on the SWAT team, he was one of the only guys in the unit who hadn’t gone through the military. His partners were, for the most part, special forces guys — guys who had done their skydiving training while they were in active duty. And their stories pulled Michael’s old dreams of flying right back into the light. Then, in 2016, a hammer dropped out of the blue. Michael’s wife filed for divorce. It was a hard, dark, confusing time. Then, one day that following year, Michael made an interesting discovery. He came across a Groupon for a tandem skydive. It felt really important to do. He’d wanted to jump so badly for so long, and he’d been through so much – and now he was finally free to have the experience. He purchased the Groupon immediately, made the reservation and arranged for childcare for his boys. The third-party scheduling agency through which he’d booked gave Michael the address of an airport that was a bit south of Fort Atkinson, Wisconsin. He drove out there at the specified time, buzzing with excitement and anticipation. The old-timers gave Michael directions to another municipal airport between Jefferson and Fort Atkinson. He hopped back into the car and onto the phone, immediately dialing the third-party agency that he scheduled the dive with to give them a piece of his mind. He was still on the phone (with a manager who was insistent on blaming Michael for the mistake) when he pulled up to the WSC dropzone. It was a perfect day: 80 degrees, not a cloud in the sky — flawless. Andrew was Michael’s tandem instructor that day, and Elliot was the videographer. The next thing Michael knew, Elliot was on the strut, pointing a camera at his grinning face. 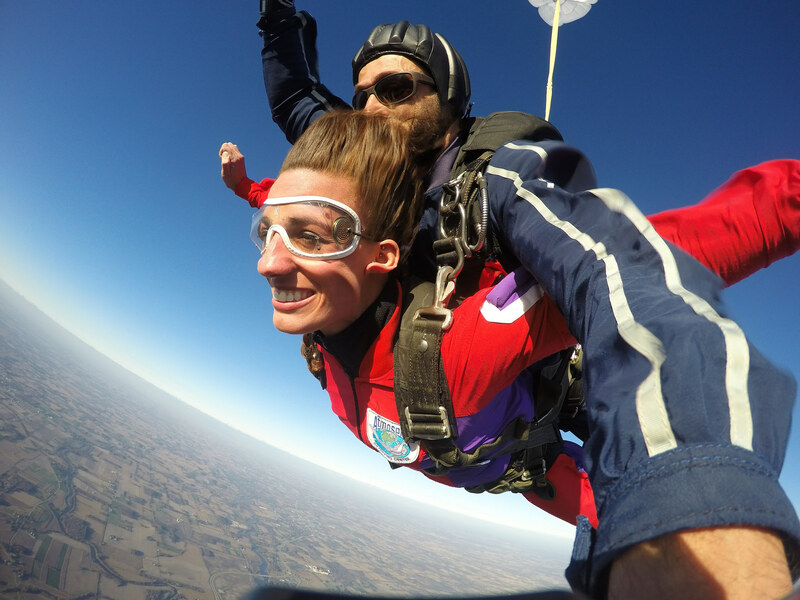 When the skydivers landed, Andrew and Elliot were both laughing. Apparently, Michael had been screaming “I’m gonna do this again.” He ran right back to the counter to do just that. Michael earned his A license in October 2017. He’s about to test for his B license. 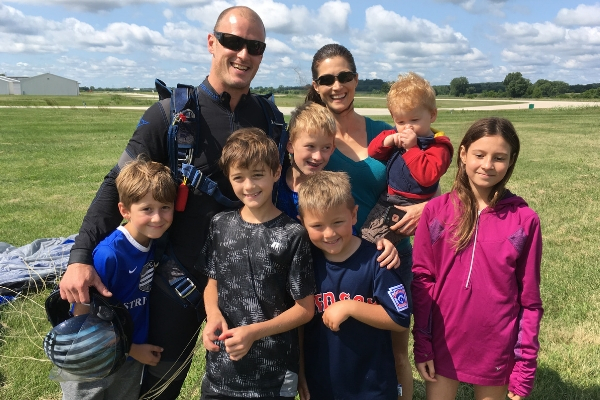 Still a teacher at heart, he now intends to get his instructional ratings so he can share the sport with brand-new skydivers just like he was when he first walked through our doors — a beautiful human with a huge heart and a yet-unrealized love of flying.